The Lotus Flower: A Symbol for… ? The significance of the lotus flower symbol is going to depend on the color of it or the religion that is associated with it. For Egyptians, the lotus flower is going to symbolized a rebirth. Therefore, it is going to be associated with the sun that is going to disappear at night and re-emerge in the morning. This is because the lotus flower is going to retract water at night and emerge in the Sun the next day. This means that the lotus flower is also going to be associated with death. The book of the dead talks about a spell that transforms people into a lotus. In Buddhism, the lotus flower is going to be associated with spiritual awakening, faithfulness, and purity. This is because it had the ability to come out of the dirty water in the morning and be clean. Therefore, it has the common factor like the Egyptians that believing it is a sign of rebirth. Since it has the ability to break the surface each morning, it suggests that it has a desire, which is associated with the spiritual enlightenment of Buddhism. In Hinduism, the lotus flower is associated with fertility, spiritually, eternity, beauty, and prosperity. This is one of the most common reasons why you are going to see the white lotus flower in Hinduism. Many of the gods and goddnesses are going to be associated with the lotus flower. Of course, the colors of the lotus flower are going to mean different things. The blue lotus flower is associated with the victory of the spirit. Therefore, it is going to represent wisdom, knowledge, and intelligence. Most of the time, when you see the blue lotus flower in a Buddhism work of art, it is going to be partially open but you will never be able to see the center of the flower. The pink lotus flower is the supreme lotus flower. This means that it is considered to be the true lotus that represents Buddha. The white lotus flower is known to symbolize Bodhi, which means to be awakened. It is also going to represent a state of mental purity. Therefore, it is known for the perfection of the spiritual world. It is also known to be associated with the pacification of the nature of one person. The white lotus flower is considered to the womb of the world. The red lotus flower is going to be associated with all matters that are related to the heart. This means that the true meaning of the red lotus flower is compassion and love. There are several different meanings for the purple lotus flower. It is known to be one of the most mystic of the lotus flowers. This is because it is associated with esoteric sects. 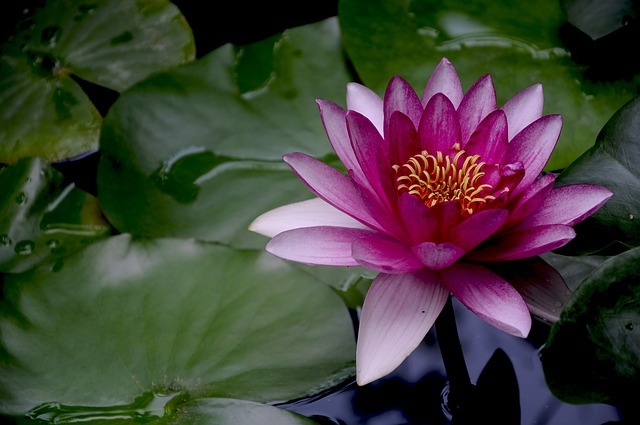 There are eight petals on the purple Lotus flower that represent the noble eight-fold path. This is one of the principal teachings of Buddha. If you follow the path that will lead to self awakening, you will be performing one of the noble truths.